Belanger Books is excited to announce calls for more publications in 2019 and 2020! Authors, there are plenty of anthologies out there to choose from involving Sherlock Holmes, Solar Pons, and other great detectives! Our publications will range from the traditional (The Early Adventures of Sherlock Holmes and Dr. Watson) to another Realms collection (Sherlock Holmes: Adventures in the Realms of Edgar Allan Poe) to more sequels (Beyond the Adventures of Sherlock Holmes). We will also have a Solar Pons horror collection entitled, The Necronomicon of Solar Pons. See submission guidelines for all of our upcoming anthologies below. Announcing "The Great Detective Universe"
What if Sherlock Holmes Wasn't Alone? While Sherlock Holmes is the best remembered detective from the Victorian and Edwardian periods, there was a rich plethora of other sleuths solving crimes throughout the world at the same time. The Great Detective Series from Belanger Books imagines that these sleuths worked together at times to fight crime and stop master thieves such as Arsene Lupin, A.J. Raffles, and Professor James Moriarty. We start the Great detective series with two books, Sherlock Holmes and the Great Detectives and Sherlock Holmes and the Occult Detectives (edited by John Linwood Grant). See submission guidelines for these anthologies below. Please send entries to mail@belangerbooks.com or to derrick@belangerbooks.com. Make sure to include your name (first and last), title of your story, story length, and attach your story as a word document. Submission guidelines: A traditional Holmes and Watson story occurring in the above mentioned time frame at a length of 5,000 - 10,000 words (okay to go over or under some). 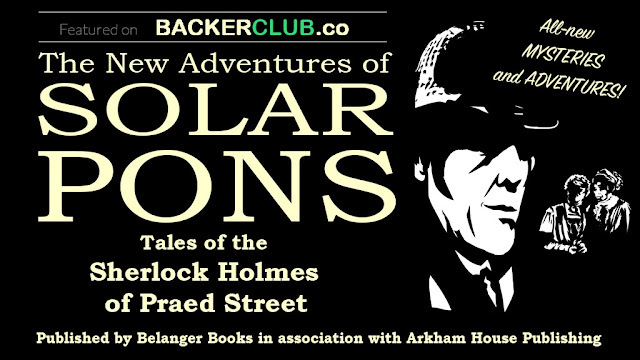 Description: Solar Pons is noted for being the Sherlock Holmes of Praed Street. But there was a connection to horror in Pons which separated him from his Baker Street mentor. It is noted that Solar Pons wrote An Examination of the Cthulhu Cult and Others. He acknowledged that Carnacki was a legitimate Ghostfinder, and he faced off against a vampire in “The Adventure of the Nosferatu”. What other horrors did Solar Pons face? What unspeakable evil did he uncover when write his examination of the Cthulhu cults? This book intends to answer those questions with new stories which merge August Derleth’s great detective with Derleth’s Cthulhu mythos. See Pons face off against vampires, demons, and the Great Old Ones! A new game is afoot! Submission guidelines: A Solar Pons horror story at a length of 5,000 - 10,000 words (okay to go over or under some). Kickstarter will run in September 2019 and publication of book will occur in November 2019. Description: For the first time ever, a collection of Sherlock Holmes adventures connected to the Master of the Macabre. Sherlock Holmes: Adventures in the Realms of Edgar Allan Poe will have Holmes working within the work of Edgar Allan Poe. Some possibilities include Holmes solving the mystery of The Tell-Tale Heart or working to save Victorian London from the Masque of the Red Death. We can see Holmes work alongside Poe's great detective Auguste Dupin. There are many possibilities. Submission guidelines: A 5,000 - 10,000 word Sherlock Holmes story connected to the work of Edgar Allan Poe. You can play around with the time periods (i.e. put Holmes in the past or connect Poe to Victorian England); however, Holmes must stay traditional (for example, he can’t be married or in love). What if Sherlock Holmes wasn’t alone? We start the Great detective series with two books, Sherlock Holmes and the Great Detectives and Sherlock Holmes and the Occult Detectives. Submission guidelines: A 5,000 - 10,000 word traditional story teaming Sherlock Holmes with another classic detective. The other detective must be in the public domain or your own original character. Description: Ghosts need apply! Sherlock Holmes always dismissed otherworldly explanations in his adventures. But, what if he and Watson had agreed to cover-up occult connections? What if he felt the world was not ready for such knowledge? These adventures involve Holmes teaming up with an occult detective such as Carnacki, Semi Dual, John Silence, or Professor Van Helsing. There are plenty of “public domain” occult or supernatural detectives to choose from or you can create your own. Submission guidelines: A 5,000 - 10,000 word traditional Sherlock Holmes and occult detective “team up” story. The other detective must be in the public domain or your own original character. The book will be set up to include the original adventure by Sir Arthur Conan Doyle followed by the sequel(s) to that adventure. No need to claim a story! We plan on publishing multiple sequels to stories (i.e. the anthology could include three sequels to The Red Headed League, two sequels to Speckled Band, four sequels to Scandal in Bohemia, etc…). Submission guidelines: A 5,000 - 10,000 word Sherlock Holmes story which is a sequel to one of the stories in The Adventures of Sherlock Holmes. Kickstarter will run in December 2019 and publication of book will occur in February 2020. The estate of August Derleth has authorized the first ever anthology of Solar Pons stories! Solar Pons solved crimes using deduction and ratiocination, often referring to Holmes as “The Master” or “My illustrious predecessor”. Since his first appearance, Pons has been a favorite with Sherlockians. These twenty new adventures range from soon after Pons and Parker met in 1919 to a story that occurs after Germany has been defeated in World War II. Each of them fully and traditionally falls within the Pontine Canon. The authors of these stories have contributed their royalties to the Jan Stauber Grant Fund for the Beacon Society, which provides scholarships to educators, schools, and Sherlockian Scion societies, allowing them to purchase Sherlock Holmes books and materials in order to introduce young people to The Canon. Join us again at 7B Praed Street where The Game is Afoot! Back the project on Kickstarter here! Belanger Books is a small press owned by artist Brian Belanger and author Derrick Belanger specializing in new Sherlock Holmes books, Solar Pons, Children's books, Classic Sci-fi, Steampunk, and genre specific anthologies. Some of our books have been #1 bestsellers in their categories on Amazon. Call for Submissions! 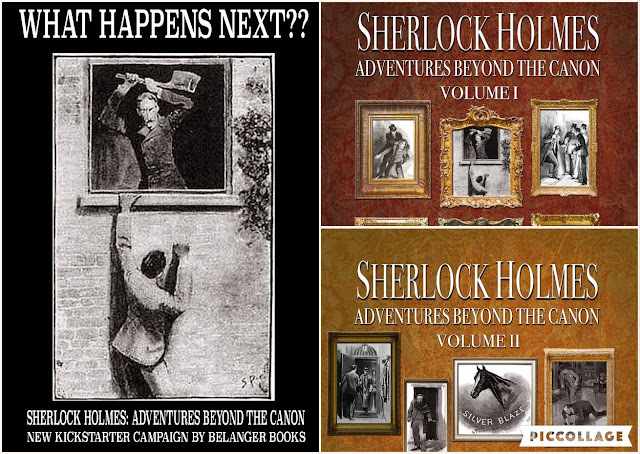 Belanger Books has Upcoming Including The Irregular Adventures of Sherlock Holmes, Sherlock Holmes: Adventures in the Realms of Steampunk, and a Tribute to H.G. Wells!!! Attention authors and prospective authors!!! 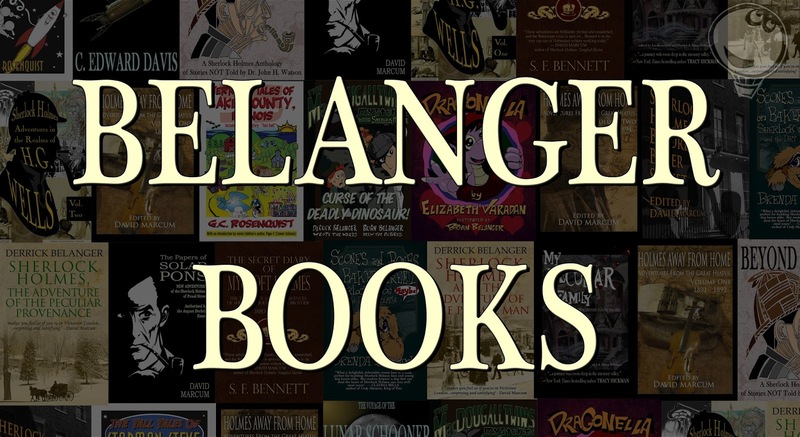 Belanger Books has a call for submissions for three upcoming anthologies! See requirements and deadlines below!! Like Sherlock Holmes: Adventures in the Realms of H.G. Wells, this collection will feature all new traditional Sherlock Holmes adventures with a science-fiction edge. Sherlock Holmes: Adventures in the Realms of Steampunk will feature Holmes in a futuristic Victorian setting. See him deal with airship pirates and steam powered robots. Maybe he’ll even deal with a time traveler or with alien invaders. Belanger Books is calling for submissions from writers, new or established, which are between 5,000 - 10,000 words (it is okay to be over or under some).